Our rotary club activities are going to be reported to the world by this page "Report to the World". Mr. Higashiguchi and Mr. Miyamoto are going to stay in LaHabra as exchange studetents between LaHabra Rotary Club and our Takarazuka Mukogawa Rotary Club in 2010. They are exciting and a little nervous due to their first trip for overseas. They are Unviersity Students and speak English for daily conversation even slow speed. Please refer the photos to find them at the airport. 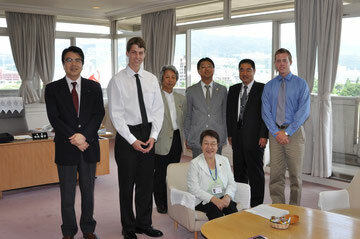 In 1982, our exchange student program started between LaHabra Rotary Club and Takarazuka Mukogawa Rotary Club. Since then, we have been exchanging our students, mainly university and college students each other every year. Students stay our families for two weeks to learn our languages and culture. Our relationship of club members , family members and students between two clubs is getting better and better. Here is more detail information of this program. 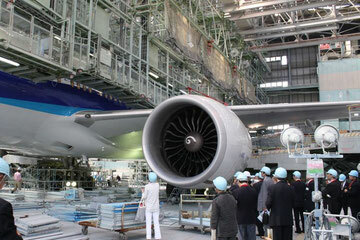 I had a chance to visit the maintenance factory of ANA at Osaka Itami Airport with the Rotary club. We visited three factories, which maintain planes B767, A320, and B777 to see the maintenance carried out by the general mechanic, re-painting and the checking of all parts of the airplane. They say that it takes several months and the cost of maintenance is approximately 100,000,000 yen, excluding the cost of parts or replacement parts. As normally these factories are not opened to the public, we were so lucky to have an opportunity to inspect them and take photos. 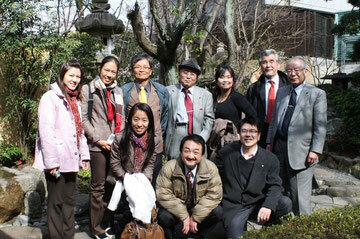 We had five members of GSE, which is the Rotary Foundation’s Group Study Exchange, in Takarazuka city in Japan. 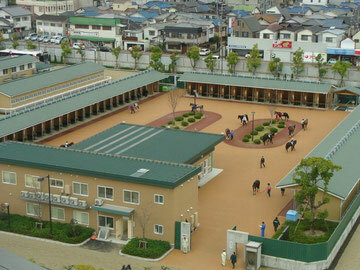 As a chairman of the International Service, I arranged a Takarazuka tour for them with other members. After we picked up our guests from their hotel at Sanda city and took a train to Takarazuka, we enjoyed a Japanese lunch at “Ganko Sushi, Takarazuka”. Then we went on a backstage tour of Takarazuka Revue visiting the several departments such as the the costume department, stage design, electricity and tools department, and we saw a rehearsal. This atmosphere was tense because the next day was the opening day. They enjoyed this tour because the Takarazuka Revue is so beautiful and played by only women, who are selected from across Japan and who practice singing and dancing very much for plays. Then, they attended the club meeting to meet our club members and each member made speeches which I translated. They gave us very warm hearted and good speeches from bottom of their heart. 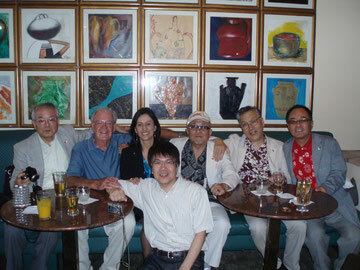 Then we enjoyed a drinks party later at the same hotel. It was a long day for us but we could understand the differences between countries and cultures through this Rotary activity. The Rotary Foundation’s Group Study Exchange (GSE) program is a unique cultural and vocational exchange opportunity for business people and professionals between the ages of 25 and 40 who are in the early stages of their careers. The program provides travel grants for teams to exchange visits in paired areas of different countries. For four to six weeks, team members experience the host country's culture and institutions, observe how their vocations are practiced abroad, develop personal and professional relationships, and exchange ideas. I was invited to the Sasayama Rotary Club, which is a rotary club located in the middle of Hyogo prefecture in Japan and in the same direct as the rotary club which I belong to now, to give a speech about my internet business. The audience were 1st and 2nd year local junior high school students who are 13 to 14 year-old boys and girls. This symposium was held by Sasayama Rotary club to invite professionals of 10 different occupations including a professional baseball player, hospital management, entertainment business worker from the Takarazuka Review, a designer, internet business worker, kindergarten manager, beauty salon manager, etc., for students to think about their future occupation. After the opening ceremony about 200 students and several professionals and staff were divided into 10 groups. 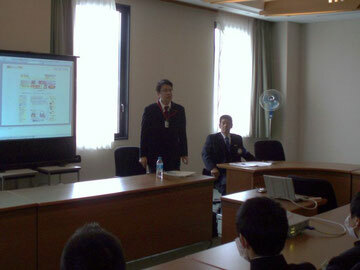 I gave a lecture about online shopping and the web consulting business including website of university. About 20 students came to hear what I had to say and they answered my questions correctly. For instance, they gave me better answers about what is the difference between an online shop and a real shop than I expected, after I explained about the system of the online shopping business. I hope that this opportunity could be helpful for them to think about their future occupations. After I visited the highest observatory in the world here in Shanghai called “Mori Building”, which is 492m high and 100 stories high and I made an inspection tour of the powerful city of Shanghai in the day time. At the same day, I participated in the meeting of the Shanghai Rotary club in China meeting on Tuesday night at the Regal International East Asia Hotel. It was the 2nd time for me to visit this historic club meeting, which is the 2nd oldest club in Asia and I found the number of members is increasing to around 70 members consisting of only foreign passport holders. I was so happy to visit this meeting because they were so welcoming me when I visited about four years ago, and this time also they welcomed me, so I donated some money to thank them for the happy time and I made a short speech. I was surprised to hear that they have 10 to 20 visitors from all over the world each time. I could meet many people and enjoyed talking. I also find the many differences between their club meeting and ours. At the beginning they say the four tests, there is no song, they have a talking “spot” where they talk about new things like we do in Japan, they give donations called “happy time” and “sad time”, then there is dinner time where we can chat with people at the same table. I talked about Shanghai Rotary Club and they asked my purpose to visit I told them that I will give a speech about the Internet at Xi’an JiaoTong University in Xi’an a few days later. If I can I would like to come here again to see the lovely people in this club. I have just come back from L.A. in the U.S. I have been in the U.S. for eight days at the same place called La Habra, which is located about a fifty minute drive from the city center of Los Angeles. My main purposes of visiting La Habra with our Rotary Club members were two things. Firstly it was to meet members of La Habra Rotary Club, which has been our sister club for twenty-four years, although we have never seen most of the members, but we know each other through our Student Exchange Program almost every year for many years. 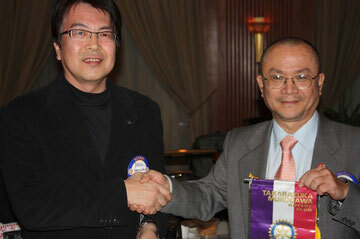 The other purpose of my visit was to join the International Convention of Rotary Club. I made a plan for this trip with my friend in the club in the U.S and tour members. We had a really good time while we were staying there, because they had prepared so many wonderful events, such as a Southern California BBQ at one of the member's houses with more than fifty guests and other parties with dancing, playing golf, swimming, Disneyland, hot rods and several events of the Rotary International Convention. We also enjoyed visiting the members' working place at the University called CSUF, a huge hospital, a lawyers’ office with twenty lawyers, a large rubber firm, a beautiful motorbike and parts shop and a successful insurance company etc. On the way back to Japan, we talked about our next meeting with our friends in La Habra Rotary Club in the near future.